Did you know that more adults loose teeth to periodontal disease than to decay? Nearly 75% of adults are affected by periodontal disease at some time in their lives. Brushing and flossing daily are the best methods of preventing gum disease and cavities. The American Dental Association recommends a soft bristle toothbrush along with plain cavity control toothpaste and floss to clean the teeth. The most important time to clean the teeth thoroughly is at night before going to bed. This prevents plaque from sitting on the teeth all night. Plaque is a biofilm that contains the bacteria that causes both decay and periodontal disease. It is formed constantly on the teeth after eating a meal. It can be removed by brushing and flossing the teeth within 24-48 hours after its formation. If left on the teeth for an extended period of time, it forms calculus otherwise known as tartar on the teeth. Professional scaling and cleaning is then needed to remove tartar. Plaque and tartar cause inflammation of the gum tissue which leads to gingivitis and periodontal disease. The best way to brush the teeth is to position the bristles of the brush at a 45 degree angle to the gum line and use a gentle circular motion. Apply light pressure when brushing. Make sure to massage the gums as you go along, being careful not to scrub the gums and cause recession. A great way to avoid scrubbing is to hold the toothbrush with just the thumb and pointer finger while brushing. This prevents heavy pressure of the brush on the teeth and gums. In the back of the mouth, it is helpful to close slightly allowing the muscles of the face to relax and give more room for the head of the toothbrush to clean. To clean the inside surfaces of the upper and lower front teeth, hold the brush vertically and make several back-and-forth strokes. For cleaning the biting surfaces of the back teeth, position the brush perpendicular to the chewing surfaces and use short strokes. Try to watch in the mirror while brushing to ensure you are cleaning each surface of the tooth and also the gums. Rinse thoroughly when finishing to get rid of all the plaque that was loosened from the teeth. Dr. Molina does not normally recommend the use of Antiseptic mouth wash due to the high alcohol content. This has a tendency to dry the mouth over time and halt the production of saliva. The less saliva that is present, the more food sticks to the teeth. The more the food that stays on the teeth, the more cavities we tend to see. Flossing is the best way to combat periodontal disease. It allows for the removal of the plaque that is in between the teeth and cannot be removed by the toothbrush alone. Developing the proper flossing technique takes time and practice, but is necessary for effective plaque removal and periodontal health. First, get a piece of floss that is about 20 inches long. The waxed floss will glide more easily than the unwaxed floss if the teeth have tight contacts. Wrap the floss around both middle fingers and use the pointer fingers and light pressure to shimmy the floss between the teeth. You should avoid snapping the floss as that can injure the gums. Wrap the floss making a C-shape around each tooth then bring the floss out. If the floss gets plaque on it, rinse it off or wind the floss until you get to a clean area. Repeat until all the teeth have been flossed. Sensitivity of the teeth can be caused by gum recession, cavities or can be experienced after dental treatment. One way to alleviate sensitivity is to use a high fluoride mouth rinse like ACT Fluoride Rinse. Fluoride has the ability, when consistently applied to the teeth, to desensitize and strengthen the enamel. Using plain cavity control toothpaste can also reduce sensitivity. The new whitening toothpastes have very large abrasive particles that can wear the enamel away. Once it is worn, it cannot be replaced. This results in thermal and sweet sensitivity. 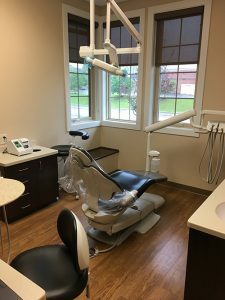 Having regular 6 month dental exams and cleanings can also prevent sensitivity by revealing cavities while they are still in a manageable state. Sometimes, when cavities are left to grow and large fillings have to be placed, patients can experience sensitivity. Usually this sensitivity is temporary and resolved within a few weeks. Whitening can also cause sensitivity which is completely reversible. When the whitening agent is discontinued, the sensitivity goes away almost immediately. Note: Whitening is a safe and effective procedure and used regularly to improve esthetics. With the overwhelming number if dental products on the market, choosing dental products can be difficult. Our office recommends electric toothbrushes and sells the Oral B Triumph. It is a great tool for the sonic removal of plaque. The combination of spinning, pulsing, and vibration has proven superior to manual brushing. We also recommend other electric brushes such as the Sonicare, the Braun, and the Ultreo but we do not sell them in the office. All four brushes achieve excellent oral hygiene on a daily basis and over the long term. When using manual brushes, the soft bristles are the only ones that should be used. Medium and hard brushes will significantly damage the gums and soft tissue due to their stiffness and inflexibility. Toothpaste comes in all brands and flavors. The ideal toothpaste has fluoride and does not have any whitening agents or mouth rinse. The fluoride strengthens the tooth on a structural and molecular level, making enamel more dense and strong. The abrasive particles in whitening agents cause tooth abrasion which can be seen mostly at the gumline. This can be a source of sensitivity and also a food trap. Floss is available in waxed and unwaxed versions and both are good for plaque removal when good technique is used. For patients with gaps or small spaces between the teeth, tape (a thicker form of floss) is ideal. Floss threaders are important for cleaning bridges and under retainers. They are located in the dental aisle near the floss.